Now there’s a Don’t Blow It for you, the thicker and more textured types! 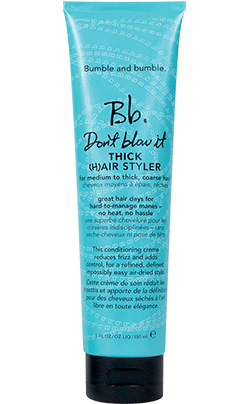 For those days when it’s just too much work to tame your tresses you can let them do their own thing with Bumble & bumble's latest product, Don’t Blow It (Thick). It adds just enough control to give you a slightly more refined, smooth look without leaving that product-y feel. UVA and UVB filters protect you from the summer sun while avocado, jojoba, almond and sunflower oils moisturize, fight frizz and add shine. Apply from mid shaft to ends and let it air dry. Check out these videos by Bumble on different ways to style with Don't Blow It!